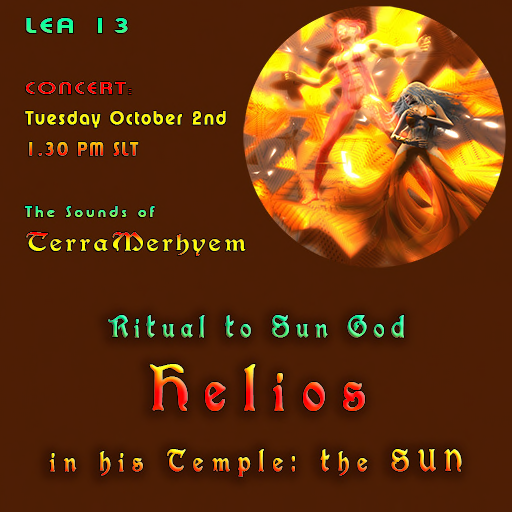 “ Ritual to Sun God HELIOS "
A few of the new Initiates, if wearing appropriate costumes, will may become Sacred Dancers of Helios! Perhaps YOU? Naturally, a so ancient and secret ritual may sound strange to the new initiated. So, be prepared to strangeness and discovering. My Friend, come to participate to this ritual. It may be magic and may give you the blessings of the mighty Helios! I, Rage & Medora will be happy and honored by your presence!